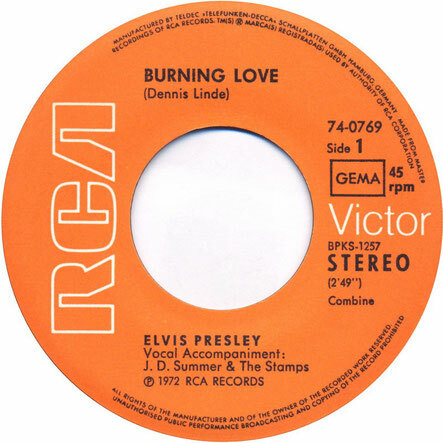 Elvis Presley performs "Burning Love"
Elvis Presley's cover version became much more popular than the original version, and was released as a single on August 1, 1972, with the B-side "It's a Matter of Time", and it reached the Top 40 on the country charts, peaking at #36. Elvis had recorded it at RCA's Hollywood studios on March 28, 1972. It was his last big hit.The electric guitar opening and riffs were overdubbed and played by Dennis Linde himself. For the week of October 28, 1972, "Burning Love" rose to #2 on the Billboard Hot 100, being kept from #1 by Chuck Berry's novelty song "My Ding-a-Ling. "However, it reached #1 on Cashbox's Top 40 Charts for the week of November 11, which gave him 20 US #1 hits. 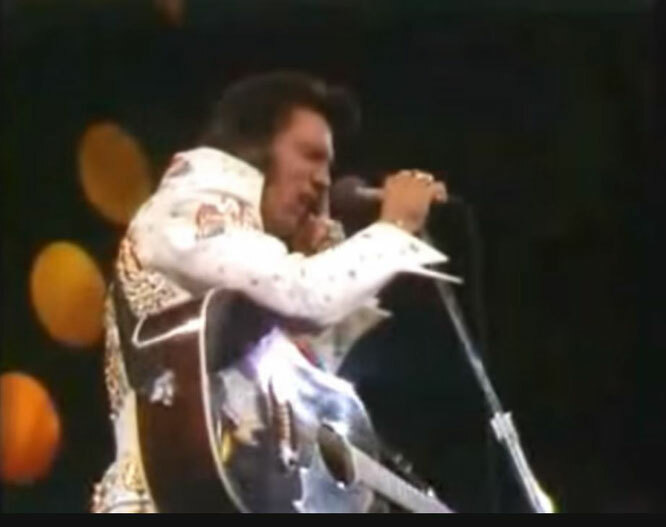 The song was Elvis's 40th and last Top Ten hit on the US charts. It was also one of the last real rock songs in the last years of his life; from 1972 to 1977 the majority of his songs were ballads, and many of those placed on Billboard's Hot Country Singles chart. "Burning Love" was one of the few exceptions, along with "Promised Land" in 1974. The song was also released on an album titled Burning Love and Hits from his Movies: Volume 2 on November 1, 1972. Despite this album's subtitle, none of the movie songs on it were ever hits. The only actual hit on the album was the title song, "Burning Love"